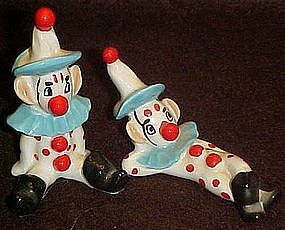 These sweet little vintage clowns will make you smile and remember the circus days of yesteryear, when clowns were silly and a joy to behold. Made of hand painted glazed pottery. The tallest measures just over 3" tall. Both have a Kelvin's sticker. They are in perfect condition.